Academy Award-nominated for his groundbreaking animated short of the same name, filmmaker Shane Acker makes his feature directorial debut with this expanded version of his acclaimed post-apocalyptic fable. In a world parallel to our own, the worst has happened, and humanity is in danger of extinction. 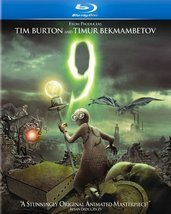 From the ashes of destruction emerges a courageous rag doll named 9 (voice of Elijah Wood) whose unique leadership skills could prove the key to survival for those who have not yet perished. Perhaps with a little help from his friends, who include domineering war veteran 1 (voice of Christopher Plummer), aging inventor 2 (voice of Martin Landau), stout mechanic 5 (voice of John C. Reilly), visionary artist 6 (voice of Crispin Glover), and fearless warrior 7 (voice of Jennifer Connelly), 9 will prove capable of salvaging what still remains of this world, and laying the groundwork for a hopeful future. Produced by Tim Burton, Timur Bekmambetov (Wanted, Night Watch), and Jim Lemley (The Diving Bell and the Butterfly), 9 takes viewers on a surrealistic journey into a world where anything is possible.